The heart can only take so much. And you’ll be hard-pressed to stop yours from breaking after reading the following and taking it in. This is Zayd Hussein Tayyeb. He’s an Ansarullahi medic from the holy city of Dahyan in Yemen’s Saada. He’s saved countless lives on the northern Yemeni front, both civilians and fighters. 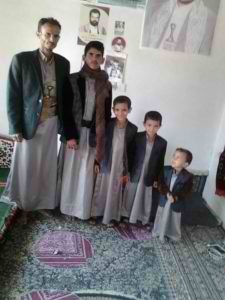 On the left he is pictured with his younger brother Yusuf and his three sons, Ahmed, Ali and Hassan on Eid al-Adha last year. A family united. A family intact. Although the criminal, barbaric war and siege brought upon the Yemeni nation by US-UK-‘Israeli’-backed Saudi Arabia raged all around them… They stayed together and found a way to observe Islam’s second holiest celebration. Fast forward to the present when tragedy struck. That’s the middle photo. On August 9th, the monstrous, blood-drenched House of Saud bombed a school bus full of children in Dahyan as it passed through a market back to summer camp where Yemeni youths were learning and memorizing the Holy Qur’an. At least 51 children–most of them under 10–were slaughtered and more than 79 others were wounded in the massacre carried out by the Saudi “royals” with US-ZOG-provided armaments. As he had done so many times before, Mr. Tayyeb rushed to the scene minutes after the American-Saudi crime to help recover the bodies of martyrs and assist with the injured in hopes of preventing anymore deaths. The carnage was mind-boggling. Little children beheaded, dismembered and lifeless everywhere. Bloody coloring books and backpacks scattered across the streets. Mr. Tayyeb combed through the wreckage looking for survivors and instead… Found his son. Dying inside but persevering nevertheless, he solemnly carried the child’s broken and battered frame to safety. Then he found his other son. Then his brother, who had been chaperoning the picnic the children departed from before the Wahhabi tyrants took their lives. That he had the strength not to shatter after finding his slaughtered kin and then also continue to help other devastated parents… is proof positive that chivalry is far from dead. Indeed, chivalry’s very essence is Yemeni. Now for the snapshot on the right–Eid al-Adha 2018. Only a father and his youngest son remain. A family in pieces. A family destroyed. Zayd, a hero in every sense of the word, boomed that the curses of ALLAH (SWT) are upon the oppressors, criminals and murderers of the cowardly Saudi-UAE coalition and he also said that the covenant made by Ansarullah to avenge all the oppressed and disenfranchised of Yemen was one that could not ever be broken. Defiant and true words from a defiant and true man. Ansarullah has avenged the Saada School Bus Massacre in spades and continues fighting off the invaders from Riyadh and Abu Dhabi with everything they have, prevailing even when obscenely outnumbered. Still, one cannot help but feel profound sadness for the Tayyeb family and all other Yemeni families whose stories are like theirs. This shouldn’t be happening. This isn’t something that anyone should have to live with. Even the followers of Ahlul Bayt (A.S.) who were told by Imam Ali (A.S.) fourteen centuries ago that those who walk his path would know hardship upon hardship. The heart can only take so much. Unless it is a Yemeni heart. Because a Yemeni heart can take any agony… Any tragedy… Any suffering… Grow another layer of armor… And pump better and stronger than it did before. Ta7ya Yemen. We pray that Zayd Hussein Tayyeb’s heart heals in time. And that little Hassan’s heart is too young now to know the crippling and excruciating hurt of this loss and that he’ll grow up to honor his uncle and his brothers with a righteous life. We pray for their health. We pray for the preservation of their lives. We pray for the elevation of Yusuf (R.A.), Ahmed (R.A.) and Ali’s (R.A.) souls. And it goes without saying, in the spirit of Ansarullah’s Sarkha, that we pray for retribution to be drilled into all who had a hand in this barbaric and evil affront to humanity. May such savages be shown no mercy. May they get to know–intimately and repetitively–that ALLAH (SWT) is Al-Mountaqim and Al-Muzil. Justice for the Tayyeb family. Justice for all of Yemen.